Welcome to my new blog series where I’ll be sharing my personal experience with the Holy Spirit. I’m doing this in the hope that readers will be encouraged to embark on a journey — or deepen their current journey — of friendship and discovery with the Spirit of God. Why is the Holy Spirit so Mysterious? But how can the Spirit teach, guide, and lead us if the Spirit doesn’t want to be known? What kind of deep, meaningful relationship can we expect to have with a God who doesn’t want to be known? Or is it possible that we have gotten it wrong? Perhaps God does want to be both known and experienced — more so than what we can imagine as John 17:3 states: “This is eternal life, that they may know you, the only true God” (Jn. 17:3). Yet mystery still seems to separate us from the Spirit. It’s as 1 Timothy 3:16 says, “without any doubt, the mystery of our religion is great.” Yet God’s mystery is mystery with purpose — it’s an invitation. God’s mystery exists to entice us into personal discovery and rewarding friendship so that “nothing is covered up that will not be uncovered, and nothing secret that will not become known” (Mt. 10:26). But we erected another veil and we laid this manufactured veil over the Spirit of God once again, as though the temple had never been opened to us in the first place. Perhaps we did this to shield ourselves from not only a very powerful Spirit but also a conflicting Spirit who both confounds and unsettles. After all, the Spirit turns the tables on our preconceived ideals regarding who we believe God MUST be. Veils have purpose. They have a wonderful, enigmatic way of creating mystery. But mysteries are meant to be revealed at the proper time and the Spirit’s release came long ago. We must now play catch up. It is for this reason that I believe God is currently not only redeeming the time but accelerating the time as well. We urgently need the Spirit’s guidance and help to become the Church we were meant to be. We have created distance between us and the Spirit of God simply by believing the Spirit is unknowable. But there is a person standing behind the fraudulent veil we have erected. So how do we begin again? How do we seek the Spirit as leader, teacher, guide, and friend? My spiritual life changed when I began pursuing the Holy Spirit like the immense treasure she is. Now my first encounter with the Holy Spirit actually happened the day I chose to become a Christian. 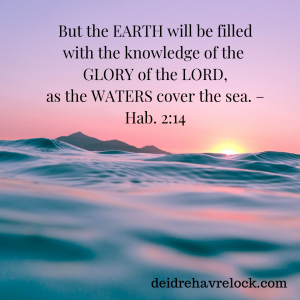 Upon making the choice to follow Jesus, I was immediately enveloped in a “presence.” The presence was completely invisible yet entirely tangible to my senses. I felt loved. I felt at peace. I felt welcomed and comforted. I even spoke in tongues without knowing what exactly tongues was. It wasn’t until two years later that my experience with the Spirit took on a new dimension that would expand both my Christian life and my theology. I was darting through a forest. And for some unknown reason an axe murderer was chasing me down. Growing tired, I quickly spied a hiding place—up ahead was an outhouse. I ducked inside, locking the door behind me. But the axe murderer quickly followed, madly hatching away at the door. Luckily, inside this outhouse there happened to be a window overtop the toilet. I opened the window and stuck my head through. However, I was now faced with the startling fact that my outhouse overlooked the ocean. Unexpectedly, from the sky descended a woman, seemingly floating or flying through the air. She was intensely beautiful. Though I can’t tell you exactly what she looked liked. In fact, I can’t remember anything about her face or skin color. I can tell you she absolutely radiated beauty but that beauty didn’t come from the way she looked — it came from her presence. She shone exceedingly bright, she was extremely calm, and she said to me, “Take my hands.” So I grasped for her and she immediately pulled me through the window and we floated toward the ground below, gently landing on a sandy beach where we walked hand-in-hand for quite a while. It was an incredibly peaceful moment and the most gentle of experiences. I honestly felt like a little girl again. I could have walked with this beautiful woman forever. I was completely satisfied. But soon she spoke, telling me I had invented the dream myself, to create excitement. It was true. For so many years during my childhood I had lived with tormenting nightmares. Because of these demonic nightmares, I had grown use to the adrenaline rush of fear. But now, as a Christian, the demonic dreams had vanished, so here I was creating my own adrenaline rush. This bit of supernatural council I received from “the beautiful woman” has helped me throughout the years in so many ways. Now I realize many readers will come to the conclusion that I had a “Mary visitation” and this is understandable. After all, the woman dressed in white with the flowing scarf covering part of her head certainly is reminiscent of Mary. However, I assumed the woman was an angel—a lady angel without wings. The Bible speaks about women angels who happen to have wings (see Zech. 5:9); therefore, I assumed this was an angel without wings. After all, this woman seeming flew down from heaven and isn’t that what angels do? The only part that bothered me about my “angel” explanation was the fact that I felt incredibly drawn to this woman; I felt deeply at peace with her. I simply did not want to leave this woman’s side. If this woman was indeed an angel, why did I want to be in her company so badly? I found myself daydreaming about this “angel,” attempting to mentally return to her presence. It occurred to me then that God wouldn’t want me to give my affections to an angel and I seriously wondered if I was committing some sort of “spiritual adultery.” I began forcing this mystifying angel out of my mind. It wasn’t until later, after the beautiful woman appeared to me again, that I embarked on seeking a biblical explanation regarding her identity. 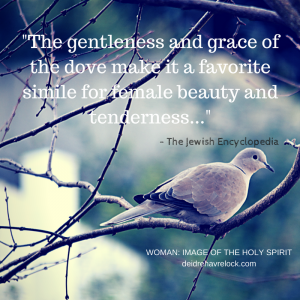 John literally saw the Holy Spirit’s “body image” come down from heaven and he described this image as “like a dove.” You will notice the phrase “like a dove” does not mean an actual dove was seen—it is a simile. For me, as I began my journey into the mystery of the Spirit, the first thing I realized was that this amazing team: the Son of God and the Spirit of God (the male image and the female image of God) worked together to change the world by purifying it through Jesus’ sacrificial death and the gift of the Spirit. Next, my prayer life changed. No longer was the Spirit just an invisible presence. Now the Spirit was a person. A person whose beauty and presence completely enamored me. I wanted nothing more than to pursue a relationship. Holy Spirit, forgive me if I have ignored your person, denied your person, or belittled your person in any way. You are a mystery worth pursuing. Help me to seek you and come to know you. Open my eyes and ears to you. Open my heart to you. I want to experience you and so I invite you to lead me into relationship. Amen. Read John 1:29-34 and John 3:25-30. Who is the bride that John speaks about? What is my current relationship with the Spirit like? 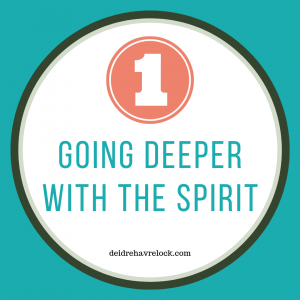 What would I like my relationship with the Spirit to be like? How do I feel about the female image being included in the divine image of God? * I have used the New Revised Standard Version unless otherwise noted. Previous articleA Flood is Coming! Great post! Have you read anything by Margaret Barker? Specifically her 2012 book Mother of the Lord? Very interesting and talks a lot about how the Holy Spirit was worshipped in Her true identity back in the first temple. Not sure I believe every single thing Barker writes, but she is a very legitimate Oxford scholar and has some absolutely incredible thoughts on worship of the Holy Spirit as Wisdom in the first temple as well as major discrepancies between Josiah’s life in 2 Chronicles/2 Kings and Jeremiah’s account of the spiritual condition of Jerusalem during his reign. The Jeremiah and Josiah diacrepancy has worship of Lady Wisdom at the center of the dispute. It’s worth reading and explains a lot, including Wisdom’s strong presence in the LXX when translated into the Greek in Egypt. I just recommend vetting her work it out well with what the Holy Spirit says. But worth a read! Personally I have a very deep relationship with the Holy Spirit, just as She is! Thanks Joel, I will look into her work. Much appreciated! Very intriguing. I have to admit your blog is the first source that truly opened my eyes to the Holy Spirit. What’s more, it’s resonating with me and I truly think you are onto something real! Look forward to reading more about it! I love Jesus so much and the Father – why has it taken me so long to feel the same about the Spirit? It’s not like I don’t love her – I do. I think right now it’s more about what the Spirit can do for me. Kinda like when you are a child and I need my Mom to do things for me – I love her and appreciate her – but I don’t really know her as a person. I think I may need to grow up. I think that makes perfect sense, Becky. Thank you for sharing your insight! Deidre, Enjoyed the article. The Shekinah was often referred to as being a Queen, a Bride. John 3:29, says that the One Who “has” the bride is the bride-Groom. It doesn’t say “will” have a bride. Does this imply the Spirit, Who came upon Jesus at His baptism, is in fact the Bride, the Shekinah? Some women who understand the bridal imagery of Jesus as the Bride-Groom enjoy a deeper intimacy with Him. Since the Spirit is Feminine, how do we as men relate to the Spirit as the Bride? I’m looking forward to reading more of your articles on this subject! Exactly, Jesus HAS the bride at his baptism. In other words, the “temple” of God HAS the Shekinah glory. For others who may be interested, a good book on the female Shekinah glory is The Hebrew Goddess by Raphael Patai. Great question Steve. “Some women who understand the bridal imagery of Jesus as the Bride-Groom enjoy a deeper intimacy with Him. Since the Spirit is Feminine, how do we as men relate to the Spirit as the Bride?” This question intrigues me, I hope you’ll let me know more about how you relate to her as bride! I am very blessed in this world with my family, job, and friends…but She is my treasure. The centerpiece of my heart. She is more precious than rubies to me. (Proverbs 3:15) She ia everything to my heart. Just wanted to share my thoughts. I don’t often get the opportunity to talk about it. Thanks! Joel, Thanks for sharing your thoughts. Interesting quote you gave from Wisdom of Solomon 8:2,16, “…I sought to take Her for my Bride.” I would be interested to know how your relationship with the Holy Spirit as Bride is different now than when you understood the Holy Spirit as being masculine. Thank you for publishing this post. It has come to make me realize that I have no relationship with the Holy Spirit at all! I prayed the “Prayer of Invitation” and hope to start learning about the Holy Spirit and that the Holy Spirit will guide and lead me in life. I apologize to the Holy Spirit for forgetting about Her. I’ve been so focused on Jesus and God that I had forgotten about the Holy Spirit. Thank you for your story! Your story has changed my thinking on spirituality.